During my trip in Japan last summer, I realized that the latest Ghibli anime movie, From up on Poppy Hill (japanese title 'Kokuriko Zaka Kara'), was just airing in movie theaters. Having the opportunity to watch it the day after its release, I booked a ticket in a large cinema complex in Kabukicho, near Shinjuku in Tokyo. I might be an old fan of Studio Ghibli, still I do not worship them. Of course, some of their films are wonderful but in my opinion, their recent ones are more forgettable, apart for Ponyo and The Cat Returns. The direction of From up on Poppy Hill was given to Goro Miyazaki, Hayao's son, whose only movie Tales from Earthsea was pretty uninteresting. That's why I went to the projection with a small but legitimate fear to be disappointed. Especially since the original manga published in 1980, which the film is derived from, has not left an indelible mark in history. However, I was quite pleasantly surprised. 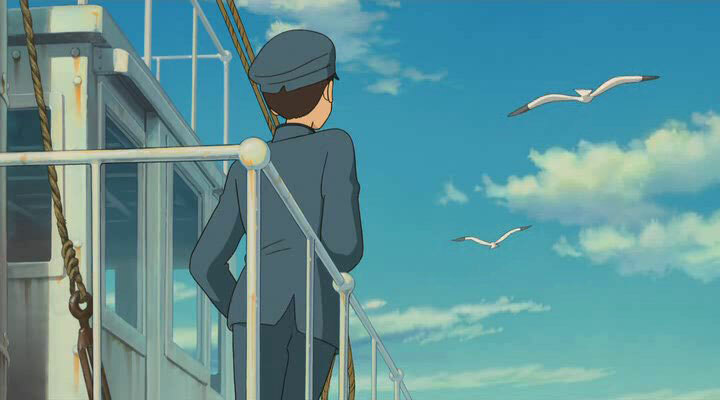 To be absolutely clear, it is certainly not the studio's best movie, but From up on Poppy Hill is one of those nice contemplative Ghibli films. Nothing much necessarily happens: the movie presents a slice of life without a villain or a great adventure. The main characters are Umi (dubbed by Japanese actress Masami Nagasawa) and Shun, two high school students who discover a mutual love. In the mean time, some questions are awakened about the disappearance of their father, whom they could share. The story takes place in 1963 in the port city of Yokohama, a few kilometers from Tokyo. The Ghibli mark is obviously very strong: character design and animation show the usual framework which the Japanese studio is used to. Some backgrounds show nice colors such as pictures of the sky, horizon of the sea and, of course, the 'Quartier Latin' building, designed by Hayao Miyazaki himself and full of lovely little details in the scenery. 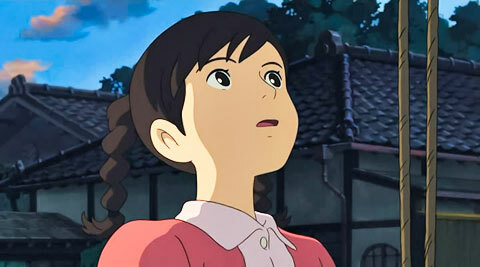 The animation of From up on Poppy Hill, however, is quite cheap. There are few frames per second and the whole film is pretty static. This is not necessarily a bad thing, but a little movement in the details wouldn't have hurt. The musical soundtrack has quite a french tone, with a lot of accordion and nice touches of piano to support the movement and the plot. Ghibli's star composer, Joe Hisaishi, was not involved in the composition but the score remains very correct. As for the theme song, calm and full of melancholy, it is totally appropriate. FYI, this is a reversal of one of Japan's most famous songs in history, 'Ue wo Muite arukô' performed by Kyu Sakamoto. From up on Poppy Hill may not be very audacious but I enjoyed it all along (about 1:45) which is a good sign since I have a surprising tendency to fall asleep if the film is a bit boring. It looks like Goro Miyazaki has learned from its failed attempt with Tales from Earthsea and that's good news. However, he has not yet reached his father's level. 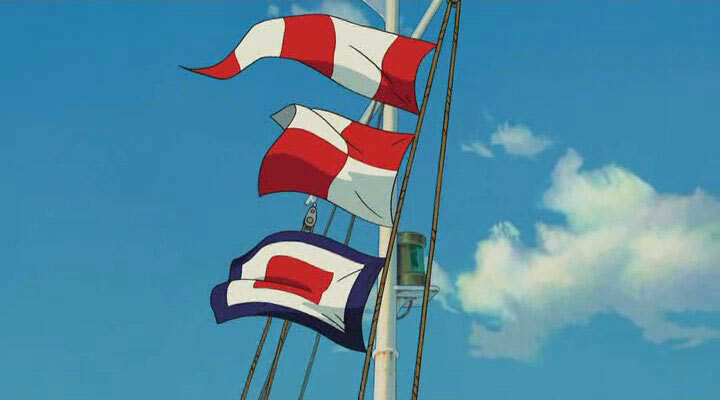 I also enjoyed the symbolic signal shared by the film. In this pre-1964 Olympic Games atmosphere, the Japanese are inclined to raze what's old, and worship whats new and futurist. But what has a history should not always be ousted or destroyed. Naturally we can draw a link with both historical directors of Studio Ghibli, Hayao Miyazaki and Isao Takahata who seem to have trouble letting new generations rise. Miyazaki's son, in this case, may offer such a point of view as a watermark. The release date of From up on Poppy Hill outside Japan is yet to be officially announced, but we can expect an early 2012 release in cinemas. In the mean time, Studio Ghibli is releasing a videogame on PS3 called Ninokuni (scheduled for november in Japan).